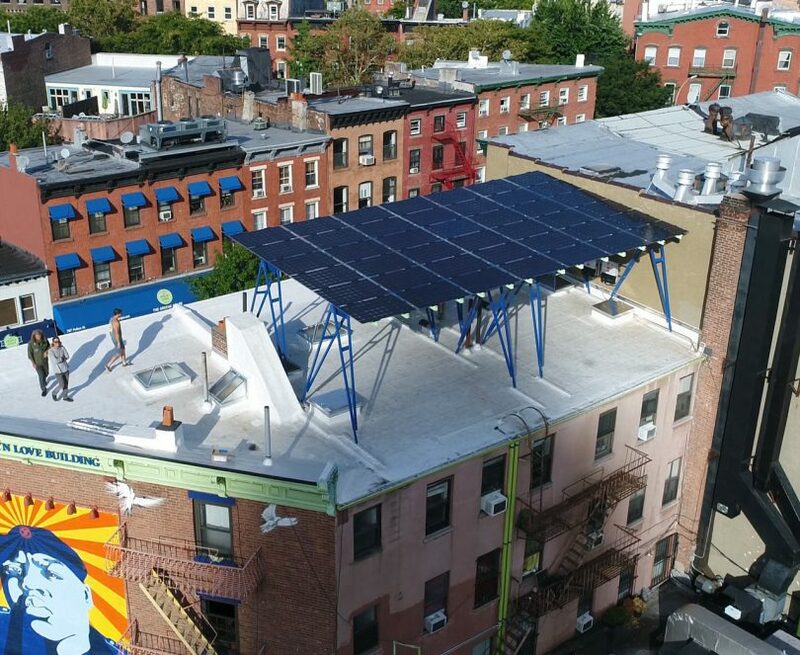 Brooklyn SolarWorks takes us behind the scenes to learn more about the process of creating the Solar Canopy. Developed in collaboration with Brooklyn’s SITU Studio, Brooklyn SolarWorks designed a new, modern take on solar technology ? the Solar Canopy ? that replaces those massive roof panels of the past with a design-focused solution. The Solar Canopy makes solar power possible for urban dwellers by adopting sleek, thin panels that rest atop a steel frame 9-feet above the ground. This setup makes way for a shaded living space or carport while eliminating the panels from direct view. For this month’s Deconstruction, the startup company takes us behind the scenes to learn more about the process of creating the Solar Canopy. Rendering of a solar canopy with dining space on a New York City rooftop. Designed in collaboration with Brooklyn-based SITU Studio, the Brooklyn Solar Canopy elevates solar systems above flat roofs in order to overcome physical obstructions, shade from adjacent properties and clear space requirements dictated by the local New York City fire code. Versatility and installation simplicity are core design features of the Brooklyn Solar Canopy. The leg assembly can elevate solar up to 13 feet; while the truss can support unsupported spans of up to 26 feet in width and 15 feet in length. Typical rooftop installations can be completed in a single day using standard industry tools.